Honda Cars Philippines, Inc. (HCPI), Honda’s automobile unit in the Philippines, unveils the New City at City of Dreams, Paranaque City. Revolving around the grand concept of “Advanced Energetic Smart Star”, the New City exhibits a high-tech and sporty design, class-leading fuel efficiency and comfort, and above class safety that provide customers with the smartest ownership experience. Outside, the New City gets a refreshed look with its redesigned front fascia that sports a low and wide stance, and stately presence. This seamlessly complements a new front and rear design that gives the New City a sharper and more aggressive look. The New City is also now equipped with LED Daytime Running Lights (DRL), while the top variant VX+ comes with LED headlights and LED fog lights. Adding to the sporty look of the New City is a new intricate-looking front grille, and exquisite diamond cut aluminium alloy wheels (16-inch for the VX and VX+ variants and 15-inch for the E CVT variant). The VX and VX+ variant also get power folding side mirrors for added convenience. Inside, the New City boasts a rich and sophisticated interior that flaunts a high-tech design, decorative panel, and plush leather seats (for the VX+) that truly highlight the New City’s sporty feel. The new metallic trim around the air-conditioning vent and gearshift, and Gun Metallic panels also welcome the passengers with a more functional beauty. The New City’s gauges and Push Start Button have also been redesigned for a more premium and elegant touch. For added convenience, the VX and VX+ variants are now equipped with Cruise Control that maintains a steady driving speed set by the driver. The New City also features a new 7-inch toucshcreen audio system for the E CVT, VX and VX+ variants that consists of Bluetooth Hands-free Telephone and Audio Streaming, and USB Connectivity. The VX and VX+ variants are equipped with a navigation system with a multi-view reverse camera with guidelines, voice command, Miracast and Cube User Interface (UI). 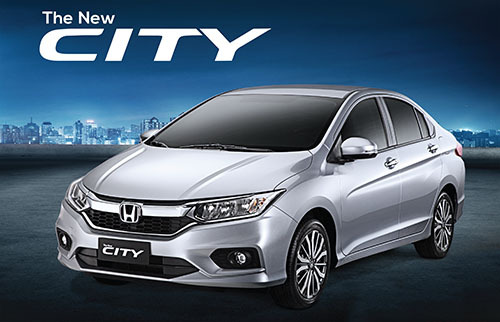 The New City is powered by the same 1.5-liter i-VTEC SOHC 4-cylinder engine that produces 120PS at 6,600rpm and 14.8kg-m of torque at 4,800rpm. The engine is mated to either a 5-speed Manual Transmission (for the base E variant) or Continuously Variable Transmission (CVT) developed under Earth Dreams Technology that delivers a dynamic and fuel efficient driving performance. The New City also features Honda’s Eco Assist System which consists of the ECON button and eco-coaching ambient meter to promote smart and fuel efficient driving habit. The New City VX and VX+ variants are also equipped with paddle shifters for a sportier driving experience. The New City further establishes itself as the smartest choice with its uncompromised safety and security. All variants are equipped with a G-CON body structure, Anti-lock Brake System (ABS), Electronic Brake-force Distribution (EBD), and Dual SRS Airbags. The VX and VX+ variants are also equipped with a smart entry system, while the VX+ variant will get additional side and side curtain airbags, Vehicle Stability Assist (VSA), Hill Start Assist (HSA), and Emergency Stop Signal (ESS) for added safety. Similar to other Honda models, HCPI is also offering genuine Modulo accessories for the New City for added style.